Are you sure you want to remove The annals of Bedford County, Pennsylvania from your list? 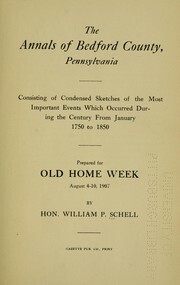 The annals of Bedford County, Pennsylvania: consisting of condensed sketches of the most important events which occurred during the century from January 1750 to 1850; prepared for Old home week, August 4-10, 1907, by Hon. William P. Schell. 1907, Gazette pub. co., print. 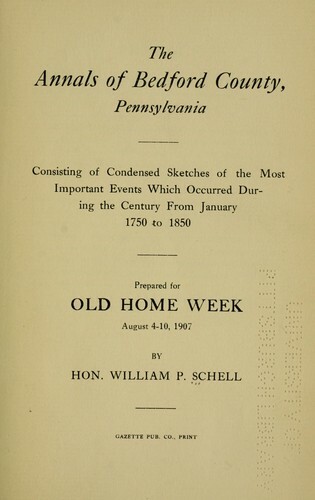 The annals of Bedford County, Pennsylvania: consisting of condensed sketches of the most important events which occurred during the century from January 1750 to 1850; prepared for Old home week, August 4-10, 1907 / by Hon. William P. Schell.